Bill Wanrooy is an author of helicopter and cat skiing powder tour guide books, and partnered with Fernie Wilderness Adventures, K3 Cat Skiing, and Powder Mountain Cat Skiing and Heli Skiing to develop and refine the Epic Planks CropDuster powder ski and subsequent line of Epic Planks skis. 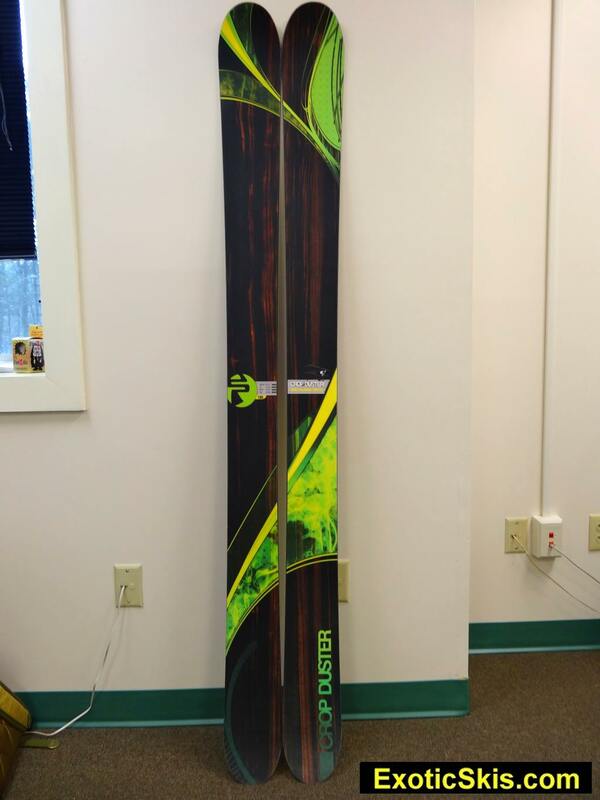 "...Built for the deepest day, but with groomer control to get you back to the lift. There is no substitute for the Crop Duster in powder. ...Back for the third season, this pow slaying masterpiece continues to push athletes to new levels. Starting with a 122mm waist and a 26m radius @185cm, tip and tail rocker combine with zero camber underfoot to create a ski that floats in any situation. Built for the deepest days, but also happy to rip down anything on the way back to the lift." I agree with their description. Right now, there appear to be two general types of powder skis: those with pintails, and those with tails nearly the same shape as the shovels (of course, there are endless variations...but for this summary, let's leave it at that). 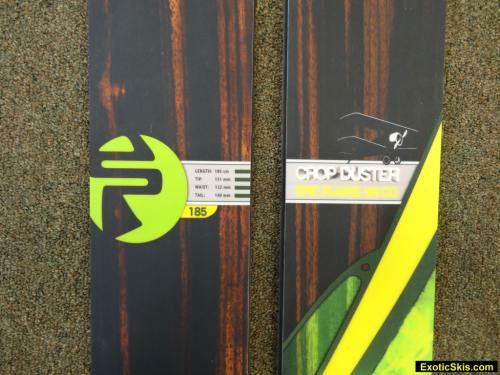 The Crop Dusters are an example of a very well balanced, moderate-stiffness powder ski with nearly symmetrical tip and tail shapes. Rather than sink the tail and surf "nose-up", the Crop Dusters like to plane and ride somewhat level in 3D snow, porpoise-ing up and down on demand along their entire length, creating a smooth, elegant powder ride. 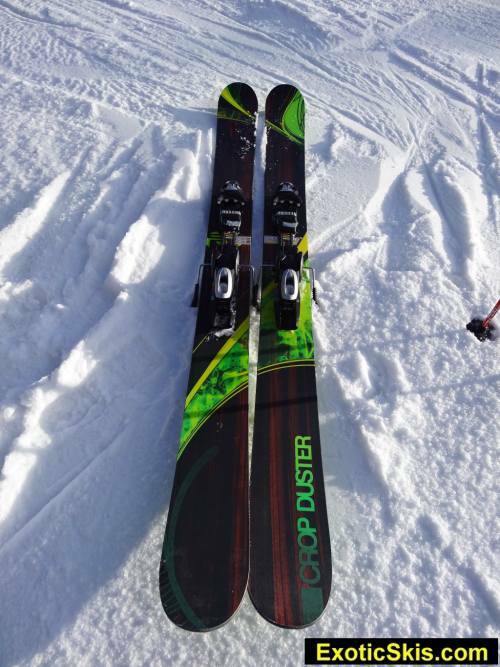 Neither overly soft and surfy, nor stiff and hard-charging, the Crop Dusters have a really wide performance envelope in lots of conditions...ideal for the majority of powder skiers out there. Remarkably grippy on hardpack if you take a punchy style rather than roll-it-and-ride-it approach to get a bite of the surface. 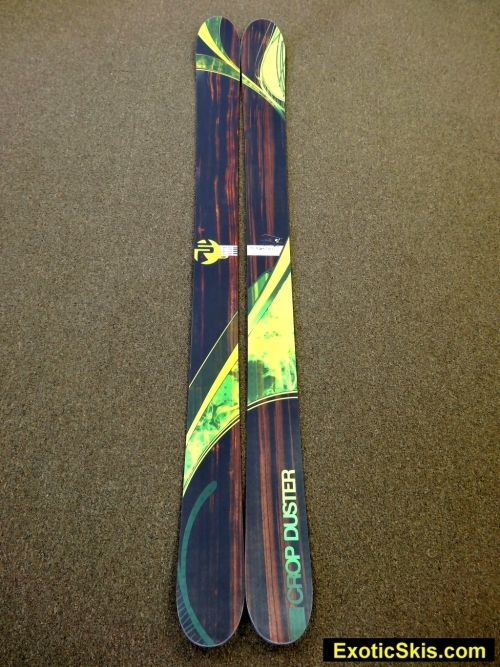 Overall, a handsome, smooth, friendly ski of great quality with a very balanced feel and enough strength to handle athletic skier desires in deep snow. A ski that grows on you the more you ski it. Tyrolia SP 12 demo bindings (stock - no riser plate) mounted "on-the-line". Lange Comp Pro 120 boots. The Rippers came out of the bag nicely finished, tuned and ready-to-ride, with a top-notch fit and finish of the tops, bottoms and sidewalls. The topsheet is a matte-like, non-glossy finish that feels like it would shed snow and take a beating nicely without showing wear and tear. Flex is moderately soft fore and aft, with moderate stiffness underfoot, and good torsional strength. Fairly damp feel. Really warm and good-looking graphic with a matte-like finish topsheet Isosport material that seems very durable. Eastern hardpack (the kind you can bounce a baseball off of), packed powder groomers, ungroomed packed powder with small bumps, shin-deep powder conditions, both smooth and bumpy and icy, chunky old surfaces. First off, the Crop Dusters have a great name. Second, they are handsome with the warm colored topsheet. I like the graphics more and more as I spent time with the skis. The first few days of testing were devoid of three-dimensional snow since it had not snowed in weeks, so the Crop Dusters got lots of exercise on Eastern hardpack and packed powder - not their native element by any means. First attempts at running the big ski in GS-mode revealed merely rolling the ski up on edge and pressuring it did not result in the ski setting into its radius curvature until you got up to higher speeds. When it did hook up, it was smooth and damp, without much hint of nervousness or wander. It set its edge nicely and rode out the turn securely. If you relaxed the pressure, the ski would naturally want to straighten out the turn, but always predictably, never any surprises. Getting into a more punchy, slalom-like turn mode on hardpack revealed the big Crop Dusters would bite and change direction quite easily and predictably, and were somewhat quicker than you might expect, which is a good thing and pretty fun. Vibration control on hard surfaces was very good, never getting any irritation underfoot or along the ski's length, even on boilerplate surfaces. That will help make a long day in sketchy, sometimes rock-hard conditions easier on the pilot's feet and legs. Higher-speed GS-like arcs across hardpack were predictable and secure, with a degree of quiet I really liked, without the ski being overly damp or dead feeling. The Crop Dusters would crank out a spunky turn on the hardpack without any trouble. We kept them sharp tip to tail with no problems. The Crop Dusters were very good at traversing different snow surfaces without deviations, showing a preference for planing above the surface rather than cutting or plowing through it. Some people want a freight train, others want a surfer. The Crop Dusters are more surfer than freight train in mixed conditions. Deflection was never a problem, but with a wide, 151mm shovel, the surface area up front can telegraph the snow condition through the rest of the ski's body in a way a shark-nosed powder ski does not. This can sometimes be a benefit in mixed conditions when you need to anticipate how to weight the ski as you traverse the terrain. The Crop Dusters have a good feel for the snow, giving you a gradual feel for what they are running over, never a surprise directly underfoot. "Predictive" feel is a good way to describe it. The Crop Dusters are a large-surface-area ski, and with the moderate stiffness, can feel big in tight bumps (not surprisingly). 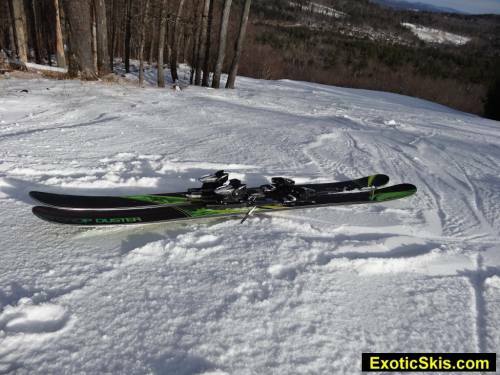 In larger-spaced bumpy terrain, the dampening and moderate stiffness works really well to provide a stable, comfortable ride, absorbing and dispersing energy from the bumps along the skis so you don't really fight or wrestle with them, but ride them along your trajectory without much effort. The rounded tails definitely are a bonus in tighter bumps, never giving you the "tails are hung up" feel some skis can deliver. In powdery bumps, the Dusters absorb and deliver a nicely controlled, refined-feel. We did not get enough powder during our test period to get any snow more than shin-deep (Vermont had a serious snow drought in January), so we feel like the Crop Dusters did not get a fair shake in their natural habitat. In the powder we did get, the Dusters were stable, easy to manage and had a distinctively balanced feel along their entire length. Smooth is the word to describe how the Crop Dusters feel as they plane along in powder. These skis do not exhibit a "surfy" feel , but a sensation of planing. You set your depth and the Dusters are happy to travel at that depth. The Crop Dusters reward a smooth, controlled technique rather than an abrupt or muscled technique. I got the distinct impression this design has been refined for several seasons to end up where it is. There are no strange behaviors, no quirks, just reliable, smooth, elegant transitions and movements. The more I skied the Crop Dusters, the more I liked them and wanted to find a plane to a big, wide powder field somewhere. 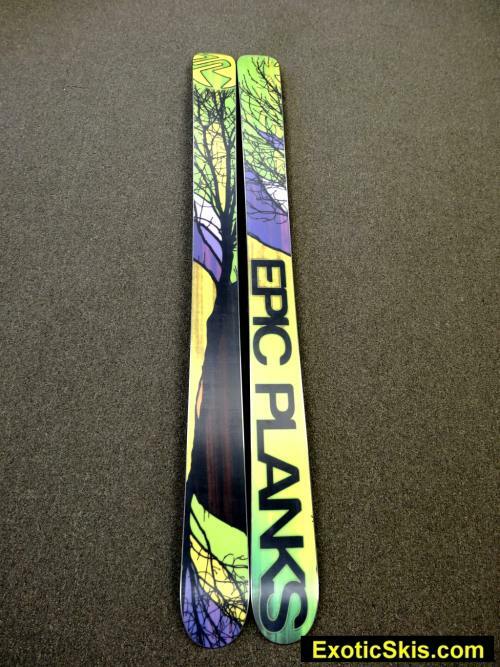 The Epic Planks Crop Dusters are not a hard-core, uber-charger, nor a floppy, over-soft noodle. They are well-designed, high-quality, nearly symmetrical rockered powder skis with a wide spectrum of comfortable, secure terrain capabilities a huge variety of people will find appealing. 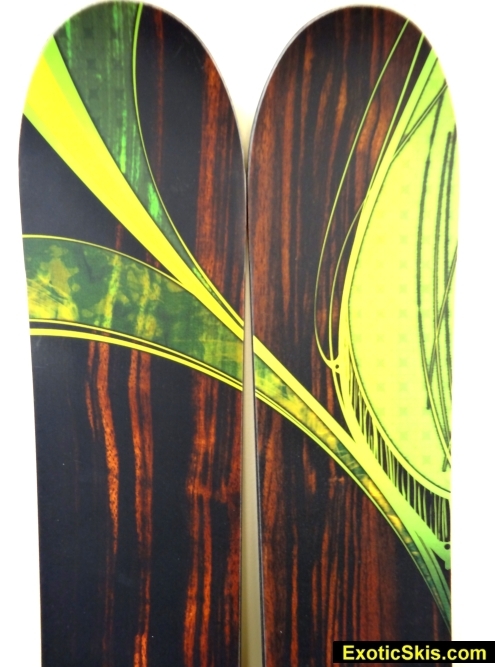 These could be a good reference standard for a planing-type of near-symmetrical powder skis. 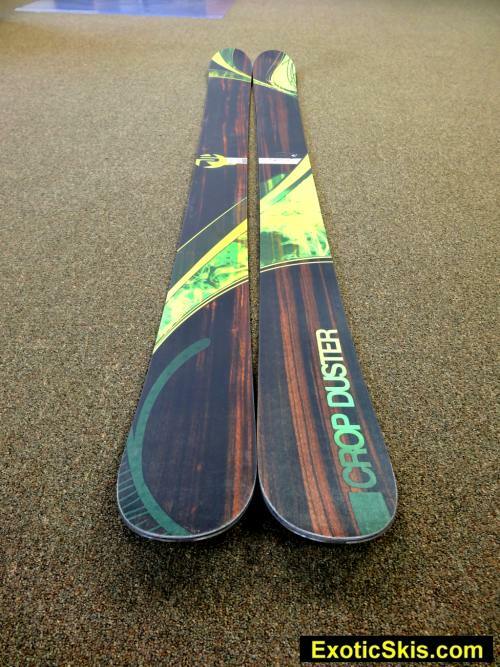 If you don't know what the snow conditions will be like on a powder trip, the Crop Dusters would be a great choice to bring. A tried-and-true novel with intrigue, adventure, elegant writing, quiet passages, nicely threaded storyline written on very nice paper bound in a handsome cover. Something you would reach for on a long trip as a reliable companion again and again, never getting tired of it. I would not change anything in this design. This ski is ideal for someone who wants a no-nonsense, classically symmetrical powder ski with above-average hardpack grip. Smooth, elegant ride that seems to have been refined over many seasons of testing. A good reference standard. If you want a pin-tail type of powder ski behavior, the Crop Duster is not for you. If you want a smooth and uncomplicated, high-quality widebody powder ski these could be just the ticket. Smooth and elegant, not point-and-shoot style.